The city of Waconia, in Carver County, Minnesota, has a long and rich history. Located just thirty miles southwest of the Twin Cities on the south shore of Lake Waconia, it has long been a tourist destination. Dakota groups lived in the area near the lake for a long time. They called the lake Meday Wa Ko Ni Ya. This meant “lake of the fountain” or “lake of the spring”. Contemporary Dakota translate it as “out of the water comes life”. Early white settlers adopted this name for the lake and the town. Over time, it evolved into “Waconia”. 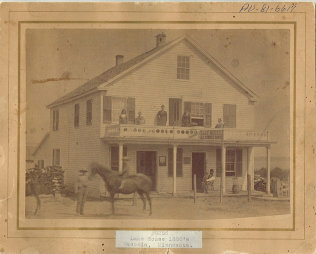 Euro-American settlers moved into the Waconia area starting in the early 1850s, after the Treaty of Mendota required the Dakota to move westward. 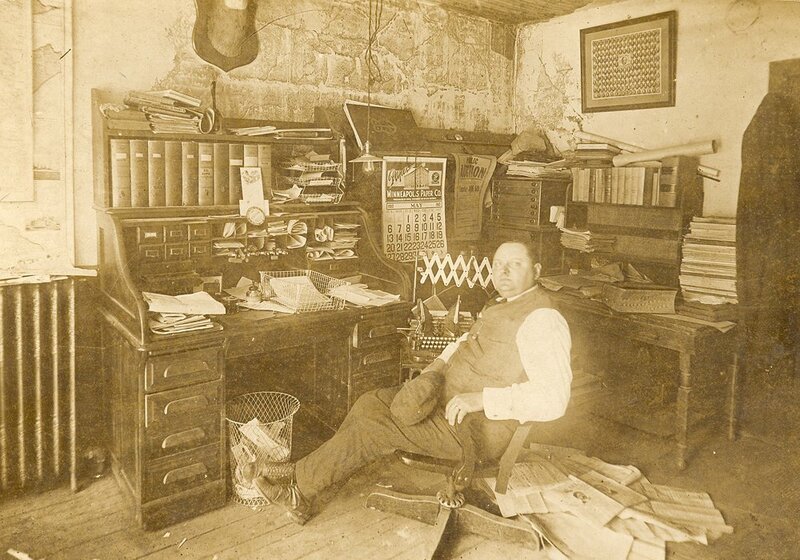 A Minneapolis surveyor officially surveyed and platted the town site in March 1857. Ludwig Sudheimer and Michael Scheidnagel were the first to build homes in this new town. Later that year, large groups of German immigrants began settling the area. Later immigrants also included Bohemians, Swedes, and the Swiss. By 1858, most of the land along the lake’s edge had residents. St. Joseph’s Roman Catholic Church was the first church built in Waconia. The congregation started in 1857 under Reverend Father Bruno Riss. 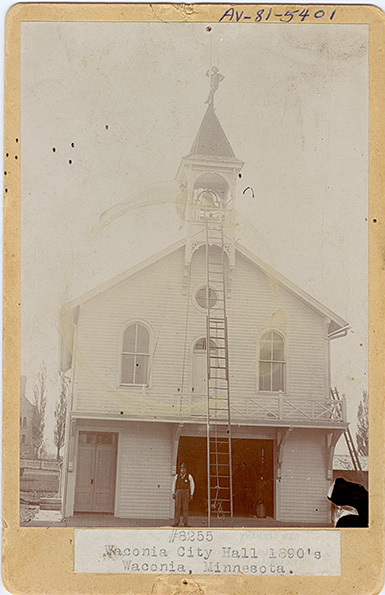 First meeting in private homes, a frame structure was built for church services for $600.00 in 1858. It was replaced by a Chaska Brick structure in 1900. 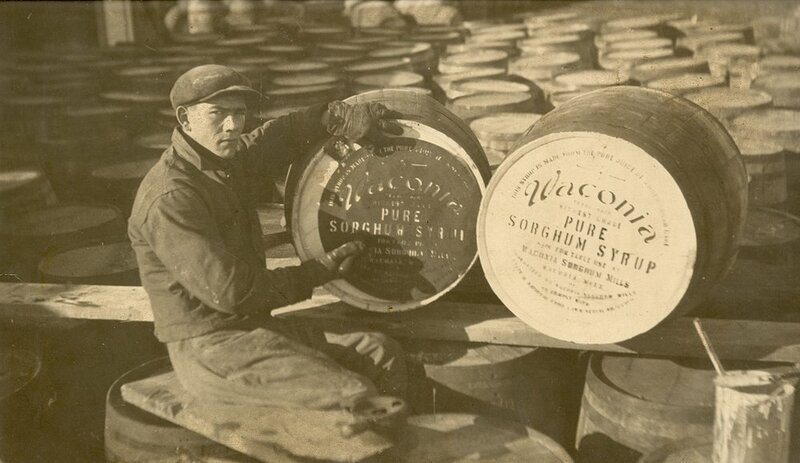 Early businesses established in the 1860s to the 1940s included the Waconia Sorghum Mill, Waconia Steam Saw and Flowering Mill (one of many saw and gristmills), and the Waconia Brewery. 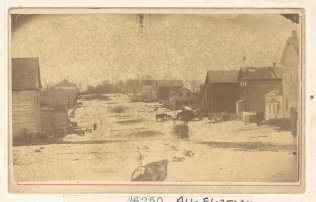 The town also had a busy ice harvesting industry. 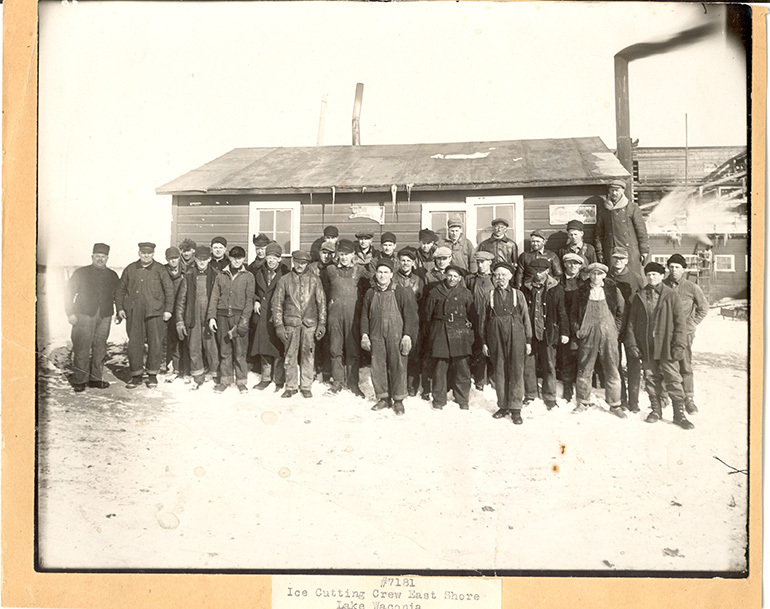 Ice harvesting lasted until the late 1930s, when refrigeration replaced the need for ice. Ice was harvested by cutting blocks of ice out of the lake when it froze over, and packing them in sawdust to keep them from melting as quickly. It was then stored in local ice-houses or shipped to cities. 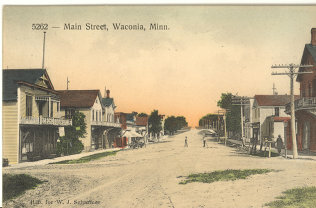 Although Waconia’s growth was negatively affected by the grasshopper plagues of 1873-77, by 1880, Waconia was large enough to be incorporated as a village. 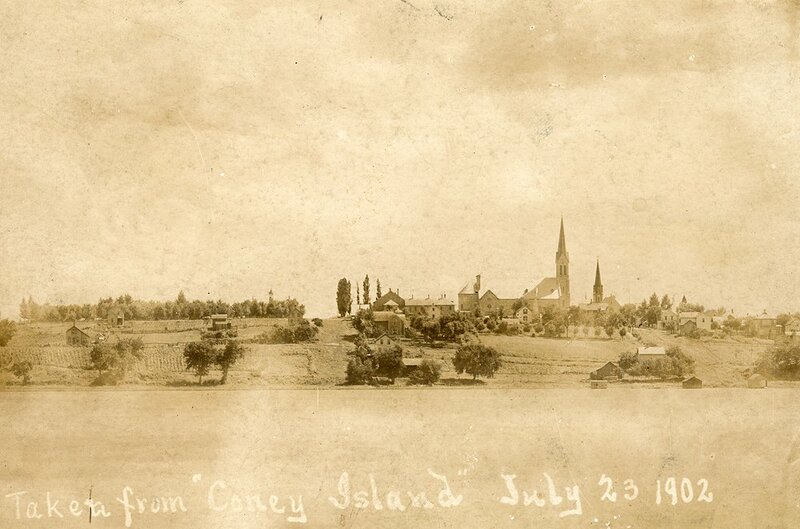 With better railroad access, the town became a popular summer destination in 1884, with the development of the large island in the center of the lake into Coney Island of the West. Town residents had long used the island, once called Paradise Island, for summer recreation. New owners turned it into a resort. The island housed a hotel and dozens of public or privately owned cabins, as well as the many hotels in the town limits. Tourists spent days, weeks, or the whole summer in Waconia. 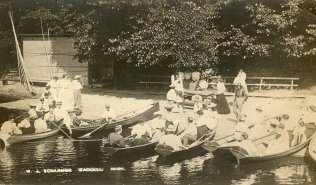 The town and island resort became the “Paradise of the Northwest” with visitors from around the country. 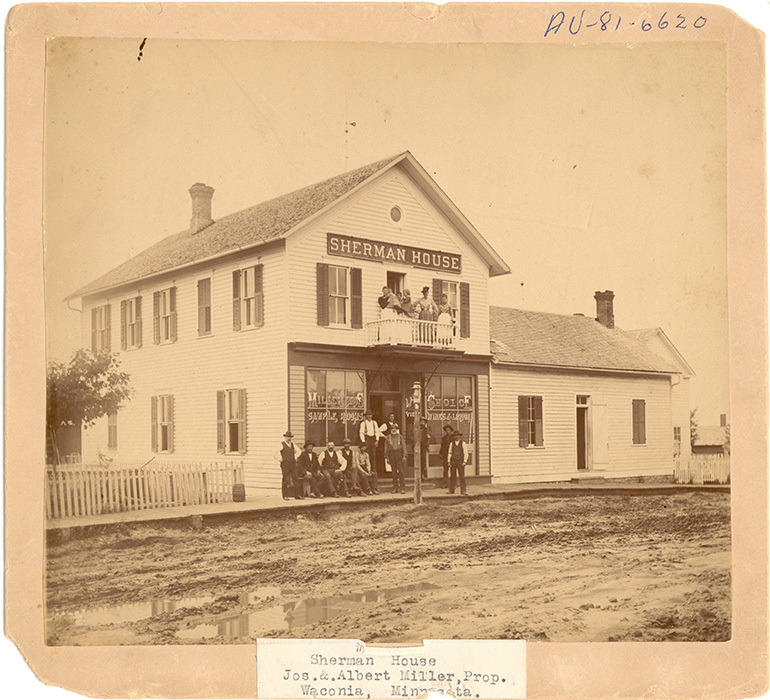 On December 31, 1886, the new Hutchinson Branch of the Great Northern Railroad opened. It ran just north of Lake Waconia. This branch was the longest stretch of completely straight rail track in the world. It brought even more tourists and residents to the lake. 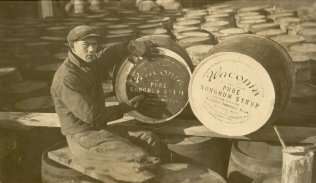 Waconia continued to grow and expand into the twentieth century. 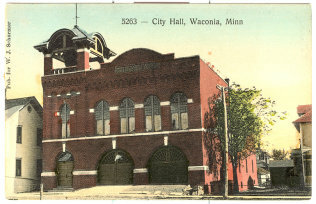 The 1904 Waconia Cyclone damaged the town, but residents rebuilt. By 1921, the town had grown enough to be incorporated as a city. The first sanitary sewer system was installed in 1924. Minnesota’s Attorney General Benson filed one of the first environmental lawsuits in Minnesota and America in 1932. The suit accused Waconia Creamery of polluting the lake. The suit ended with both the Creamery and City promising better sewage treatment. 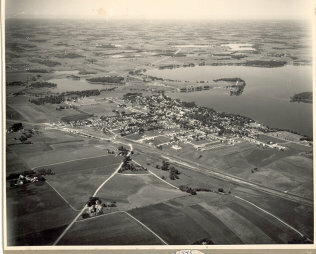 A 1986 survey of Lake Waconia showed pollution levels lower than in the early 1900s. In the early twenty-first century, Waconia continues to grow. A population boom from 6,814 in 2003 to 10,697 in 2012 made Waconia one of the three largest cities in Carver County. Waconia maintains many businesses and tourist attractions. Among them are the Carver County Historical Society, Ridgeview Hospital, Independent School District #110, Safari Island Community Center, an industrial park, Island View Golf Club, three wineries, and the Historic Andrew Peterson Farmstead. Turning Point: Development of Coney Island beginning in 1884 led to the growth of Waconia as a summer tourist destination, known as the “Paradise of the Northwest”. 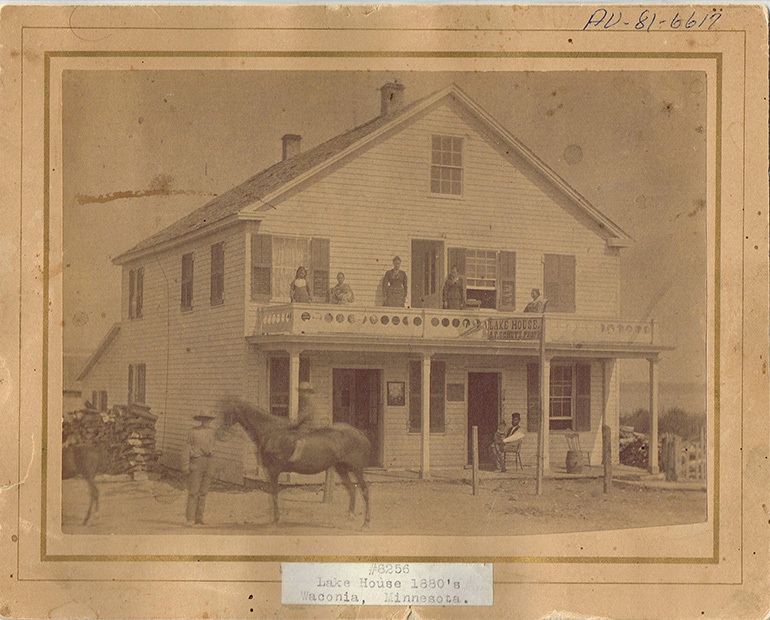 1850s: Immigrants begin settling what would become the city of Waconia. March 1857: Waconia townsite surveyed and platted. More settlers arrive. 1858: Most of the land along the edge of Lake Waconia is claimed. 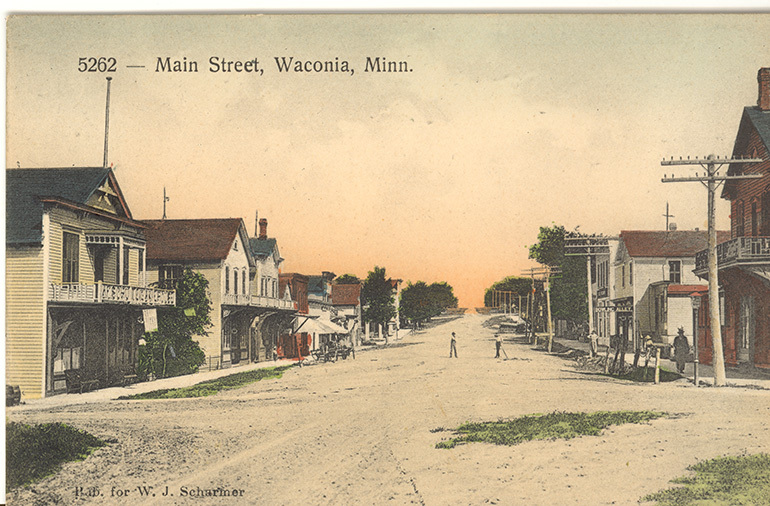 1880: Incorporated as the Village of Waconia. December 31, 1886: The Hutchinson Branch of the Great Northern Railroad opens, stretching just north of Lake Waconia. 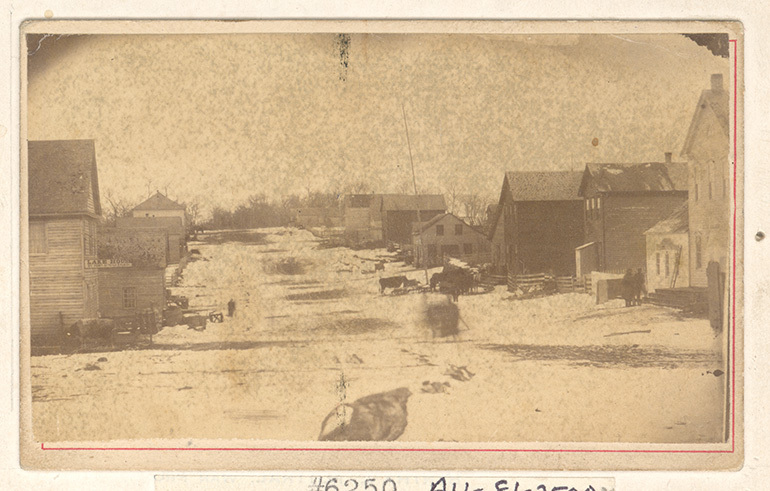 August 20, 1904: The Waconia Cyclone damages much of the town. 1921: Incorporated as City of Waconia. 1924: Waconia’s first sanitary sewer system installed. 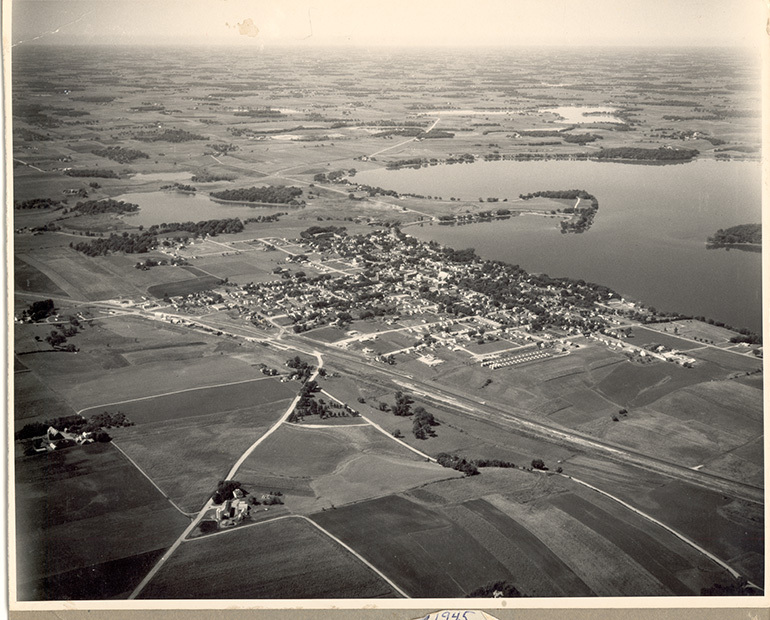 1932: An environmental lawsuit by the state’s Attorney General is filed against Waconia Creamery for lake pollution. 1978: Coney Island is placed on the National Register of Historic Places. 2007: The city of Waconia celebrates its Sesquicentennial. 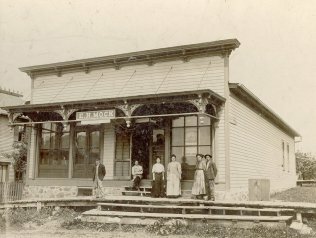 Waconia Heritage Association. Waconia, Paradise of the Northwest: The Lake and Its Island. Dallas: Taylor Publishing Company, 1986. “An Act to Construct Chanel Connecting Minnetonka & Waconia Lakes”. Weekly Valley Herald, April 16, 1874. “Chanhassen: 4 Swedish Men Arrive to Repair Granary Roof of Historic Farm in Scandia”. Carver County News, October 12, 2006. “Coney Island Nominated for National Registry”. Waconia Patriot, January 29, 1976. “County Project Gets Historical Society Grant”. Carver County News, July 27, 1978. “County Seat Question - About Moving It From Chaska to Waconia”. Weekly Valley Herald, March 4, 1880. “Development Plans: Waconia Must Have Sewer & Water Works”. Waconia Patriot, May 4, 1922. “Development Plans: Work Began Gutting the Old City Hall for the Construction of a 13 Unit, Elderly Housing Project”. Waconia Patriot, January 12, 1984. “Island Sold. Soon to Be “Coney Island””. Weekly Valley Herald, March 13, 1884. Miller Dunwiddie Architects, Inc. “Coney Island of the West”. Research and planning study of Coney Island of the West, Waconia Lake, Carver County, Minnesota : for the city of Waconia. Minneapolis, MN: Miller Dunwiddie Architects, Inc., 1979. “New City Hall Now Open for Business”. Waconia Patriot, January 8, 2004. Petersen-Biorn, Wendy. “Yellowstone Trail: Remembering the 'Good Road'”. Chaska Herald, September 2, 2012. Ridge, Alice A. and John William. Introducing the Yellowstone Trail: A Good Road from Plymouth Rock to Puget Sound, 1912-1930. Altoona, WI: Yellowstone Trail Publishers, 2000. Salden, Jessica. “County Interested in Historic Peterson Farm”. Carver County News, October 26, 2006. “Waconia Bicentennial Display Being Shown in Waconia”. Waconia Patriot, April 17, 1975. “Waconia City Hall Nominated to National Register – Photo”. Carver County Herald, March 9, 1983. “Waconia Designated as Logical Place. . .Historical and Veteran’s Building to be Erected”. Weekly Valley Herald, May 22, 1947. “Waconia Is Devastated. City Hall Damaged”. Waconia Patriot, August 26, 1904. Warner, George E. and Charles M. Foote. History of the Minnesota Valley: Carver County. Reprint. Carver County Historical Society, 1986. Originally published in George E. Warner and Charles M. Foote, History of the Minnesota Valley, Minneapolis: North Star Publishing Company, 1882. Westman, Tama. “Swedish Homesteader a Celebrity in Homeland”. Chanhassen Villager, March 17, 2005. Carver County: Today and Yesterday. Compiled by the Carver County Statehood Centennial Committee, 1958. Holcombe, Maj. R.I., ed. Compendium of History and Biography of Carver and Hennepin Counties, Minnesota. Henry Taylor and Company: Chicago, 1915. “Life in Carver County.” Carver County Citizen. 7 no. 2 (December 2006): 1-4. Lofstrom, Ted and Lynne VanBrocklin Spaeth. Carver County: A Guide to Its Historic and Prehistoric Places. St. Paul: Minnesota Historical Society Press, 1978. Mihelich, Josephine. Andrew Peterson and the Scandia Story. Minneapolis, MN: Ford Johnson Graphics, 1984. Overcott, Nancy. At Home in the Big Woods. Lanesboro, MN: Taxon Media, 2002. Theen, Olive Ireland. Country School Days: The Vanished One Room School. St. Cloud, MN: self-published through Sentinel Print, Co., 1992. Tremblay, Ruth and Lois Schulstad. Images of America: Carver County. Arcadia Publishing: Charleston, South Carolina, 2011. 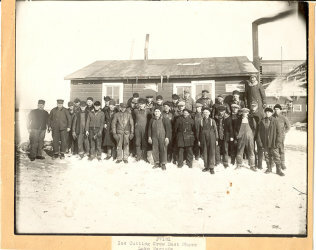 This article used with the permission of MNopedia, operated by the Minnesota Historical Society, under a Creative Commons License. No changes have been made to the article’s content.